Am I a bad person for letting someone else take care of my loved one? So many caregivers feel overwhelming guilt over their acceptance of outside help in caring for their loved one. While this is common, and most people need a support group to talk to in order to help manage these feelings, there are many reasons to let those negative feelings go. Whether you have accepted help by hiring a caregiver to come into your home, or helping your loved one adjust to 24-hour care in a nursing home, you have done the right thing – for both you and your loved one. Read on to find out why. As you have heard so many times, you must look after yourself first. While this may seem like a selfish thing to say, it’s actually a huge benefit for your loved one. Why? Because when you are healthy, happy, and well taken care of, you are a much better caregiver than you could ever hope to be when you’re run-down and frustrated. If you are totally sapped of all your energy, it’s almost impossible not to react to others with negative emotion. When your energy and health are re-established, you will have happiness, love, and friendship to offer. As the children, spouses, or friends of someone with Alzheimer’s, we feel that we are the only ones who can provide the best care for our loved ones. This is true – nobody can love your family member the way you can. But keep in mind, one person can never provide help with the Activities of Daily Living (ADL’s) the way an entire staff can! While professional caregivers will never have the commitment, loving care, and memories you can provide, they can be a life-saver when it comes to many of the more technical aspects of working with someone with Alzheimer’s. In addition, the majority of seniors say they wouldn’t want their child or other family member helping with some of the more personal tasks of caregiving (such as toileting, bathing, and dressing), but that they would be more comfortable having a professional perform those tasks if they were incapacitated. When you don’t have the added burden of assisting with ADL’s, you can focus on the most important thing – how you relate to your loved one. If you find you are feeling guilty because you think your loved one is in a less-than-ideal environment, then it may be time to make a change. 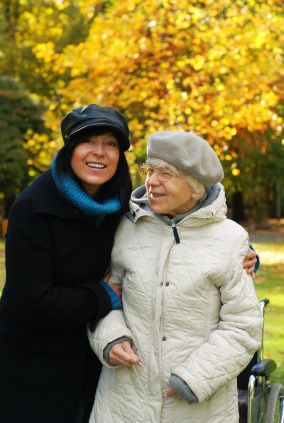 Not every caregiver or care facility is the best one for your family, and if you just can’t shake the feeling that something is not right, you must reassess the situation your loved one is in. Keep in mind that no facility or caregiver is going to be perfect, but if there’s something you’re not comfortable with regarding your loved one’s care, make a request on her behalf. You know what your loved one would want. If you have addressed a negative situation and you still feel something’s not right, look for other options. Finally, if you are caring for someone with Alzheimer’s, chances are they are someone with whom you have a loving relationship. Don’t you think that this person, although she may have changed from how you remember her, would want your happiness and well-being? At the end of the day, this is a person who cares about you just as much as you care about her. She would never wish for you to fall ill because of the negative results of caregiving duties, and she wants you to be happy – so you must believe that she would want you to care for her in a way that you can both be healthy and content. By accepting help, you have done just that – and it’s the right thing. As you return to your best shape, so will your caregiving abilities. And that’s exactly what your loved one wants. Hit the Starbucks, call your friends about starting a book club or weekly card party, and grab the newspaper for your daily crossword! Start walking! A half-hour around the neighborhood every day is perfect. Sign up for that class you've been thinking about, and get a subscription to that financial magazine.